Charlie Tuna Found in Mrs. Pelosi’s Swamp? There new critter foiund in Mrs. Pelosi’s Swamp, Charlie Tune, It seems like the minimum wage bill passed by the House under a closed rule which forbides amendment, exempts American Samoa. Mrs. Pelosi’s bill applies to every American territory save American Samoa. Starkist, of Mrs. Pelosi district, just happens to be the major employer on American Samoa. Concidence? If raising the minimum wage is to critical to helping working class American, why does Mrs. Pelosi seek to exclude the working class citizen of American Samoa? More: Lori Byrd, Wizband; Pam, Atlas. Update I: The bloggers at Powerline are all lawyers. Everybody gots to make a living. Paul defends the exemption, albeit not the minimum wage bill itself. The wage in American Samoa is about three dollars an hour and the tuna industry is already hurting. An incease to the federal minimum wage would kill the industry. So is the tuna industry American Samoa the only industry which would be threatened by a higher minimum wage? Update II: Gateway Pundit reports ‘Paul Pelosi Is “Primary” Del Monte Investor.‘ That is Paul Pelosi as in Mrs. Pelosi’s huaband, and that is Del Monte as in Star Kist’s parent company. Mrs. Pelosi backroom deal just saved her family a bundle. Mrs. Pelosi should have recused hereelf from her minimum wage bill. The Ethics Committee needs to investigate Mrs. Pelosi’s conflict of interest. Update III: Mrs Peslosi caves. More, RedState. Well there goes the tuna industry. Congress established the committee system to help prevent these kinds of mistakes. Mrs. Pelosi has choosen, to either suspend or abolish the committee system. She is trying to run a one woman House She is not doing very well. Mrs. Pelosi has named committee chairs and appointed majority members to them. 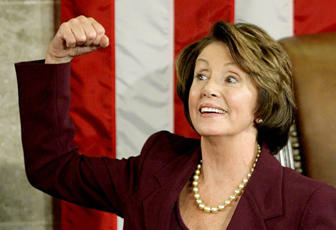 It time for Mrs. Pelosi relent her grip of abosolute power and let the committees do their work.